Talking animals in a Disney film? Nothing new there. But this sparky animation takes the idea somewhere fresh and lively by giving us a distinctly human world (well, an American version of it), with cities, streets and ice-cream parlours populated by almost every mammal you can think of – apart from our own two-legged species. So, a moose reads the evening news, a buffalo (voiced by Idris Elba) runs the police force and a lion (J K Simmons) is mayor. The cheek of it! Still, humans remain in charge. ‘Zootropolis’ is directed by Byron Howard (‘Tangled’) and Rich Moore (‘Wreck-It Ralph’). Their film is zippy and funny but also layered with a let’s-all-get-along message that feels more relevant and engaged than your average kids’ movie (including feminist gags about not calling women animals ‘cute’). Our main concern is a bunny of the female variety, Judy (Ginnifer Goodwin), who hails from simple rural rabbit stock but dreams of being a small cop in the big smoke – to her parents’ horror. After Judy graduates from police school, she’s lumbered with parking-meter duty. Luckily, her chance to shine comes when she hooks up with a crafty fox (Jason Bateman) and together they pick up the whiff of a corruption trail, taking the film into noirish ‘Chinatown’-lite territory. The world that ‘Zootropolis’ creates is intelligent and fascinatingly detailed – it feels more like a movie by Disney-owned Pixar than a straight Disney film. Its manic energy and never-ending supply of characterful animals will appeal to young viewers. But there are also some fantastic set-pieces for older audiences, including a brilliant scene with a very s-l-o-w bureaucratic sloth and a charming knock-off of the ‘What have I ever done to make you treat me so disrespectfully’ wedding scene from ‘The Godfather’. Who needs humans? P.S. look out for the vole Godfather, who has to be one of the best joke characters in the film. Zootropolis has been much-hyped, and expectations were high when I finally sat down to this creature caper on a long-haul flight, not always the most auspicious of viewing situations. What a blast! I didn't stop laughing - big belly laughs that are rarely inspired by any film, let alone an animation. Disney have truly hit a home run, with a heartwarming and super entertaining offering that hits on themes of tolerance and the evils of stereotyping without ever seeming preachy. Our protagonist Officer Hops is endearing, whilst the cast of of supporting animals range from rather scary to utterly ridiculous (the lemming brothers bank is a stroke of pure genius). I'm unsure of how much kids will enjoy it, but it hit the right note for this 25-year-old - even on a tiny screen! I really did enjoy watching this movie. It is a cute movie to watch for both adults and children alike. Lovable characters and a clever story line. Thoroughly enjoyable. Yes to a great Disney! Constantly overshadowed by Pixar in the past few years, it’s been hard for the oldie. But this time, they’ve managed to produce a fabulous piece. With its very likeable fluffy characters, it’s of course funny and cute. But first and foremost it’s far more subversive than you’d imagine. Using the analogy of animal races, it tackles sexism, racism and intolerance in such a powerful way. It teaches kids to choose love, cherish friendship and accept diversity – especially in times of uncertainty. Incredibly relevant, it’s a wonderful movie about tolerance, all wrapped up in a very sweet story. Kudo to Disney! I'm not crazy about the current Disney formula. In fairness, a huge amount of that has to do with nostalgia and what the Disney brand means to me: traditionally animated musical fairytales, for the most part. That's not Big Hero 6, or Frozen, or Wreck-It-Ralph, or Tangled - all of which I've enjoyed to varying degrees. That's definitely not Zootropolis (randomly retitled for UK audiences from the American Zootopia). Pixar derailed the old Disney formula by shifting the paradigm of the entire animation industry, and maybe I should get over something that has been happening since 1995, but I haven't and here we are. Zootropolis is definitely up there with Big Hero 6 on the enjoyment scale - it's an amazingly well crafted bit of entertainment with fun characters, and on top of that it really has something to say - but it's not all that distinct from what's happening over at Dreamworks (How to Train Your Dragon, Kung-Fu Panda) or even Warner Bros (The Lego Movie). It's probably more similar to The (superior) Lego Movie than anything else. It's diverting for an hour and a half, but unlikely to be something I'll revisit in the future. Great for kids or grown ups with a Peter Pan syndrome. It shows us that we should always follow our dreams even if they seem impossible. Probably the best Pixar movie in the last couple of years. Funny to watch but doesn't stand out for me. Predictable story and not even satire, adult humour. My favorite bit has to be the end concert scene! Great film from Pixar, definitely worth going to see whether you are young or old. Judy Hopp has always wanted to be a cop, but a bunny has never been a cop. The story starts with how she overcomes all the prejudices and finally makes it to become the first bunny cop and moves to Zootropolis where predators and prey live together in harmony. Judy has to work hard to prove herself by trying to solve a case putting the whole structure of Zootropolis in danger. You get the typical cheese bit at the end which is just missing an American flag, but in the main, the film is entertaining with a lot of humour. Disney's latest offering sees bunny rabbit Judy Hopps determined to overcome prejudice (and her tiny stature) and join the police force in capital city Zootropolis. Voiced by Ginnifer Goodwin, Judy soon gets her wish, only to find that prejudice still remains and she has to work extra hard to prove herself to her new colleagues. Finally assigned to an actual case, she sets off with Nick Wilde (voiced by Jason Bateman) to find out what is happening to animals that are going 'savage' and attacking other animals. Despite being a children's film I would highly recommend this to adults, with the usual mix of clever pop culture references and jokes that go over kids' heads. The animation is fantastic, and there is a stand out song in the 'Let It Go' vein called 'Try Everything', by Shakira. This film manage to tackle bigger themes of prejudice, but it never feels preachy or too serious. Overall an excellent animated film that can hold its own amidst stiff competition. A very enjoyable fun effort from Disney. The core theme is one close to my heart - don't let your heritage or what 'has always been' determine your future or what you think of people's capability. It's choc full of references/homages to other films which had my children asking me why I was laughing - loudly. I was also thrilled to hear Idris Elba's voice as the police chief - not sure how it escaped my radar that he was in it. I'd say this film is worth seeing but it wasn't amazing and i don't think it will be as timeless and warrant rewatching in the same way as something like the Toy Story series for example. A really nice, feel good kids film. Our 2 year old daughter loved all the cute animals and the easy to grasp storyline. We went to a preview screening so she also got to have her face painted like a tiger, the highlight of her day! The plot revolves around a city, Zootropolis, where animals are in charge.. The main characters are a lovable bunny and a cheeky fox with a good heart. A nice mix to keep the little ones entertained, but also enough adult humor to abuse the grown ups! Sweet film, good in 3d, with many adult references! Remember when cartoons were for kids? Thanks in no small part to Pixar, DreamWorks & Illumination holding down the fort across the pond as well as the utterly charming Aardman Studios on this side of the Atlantic, animation is now no longer a playground just for kids; true, the target audience is still primarily child-like in both age & size but the best and most successful animated features now possess whip-smart humour that’s definitely targeted to adults. 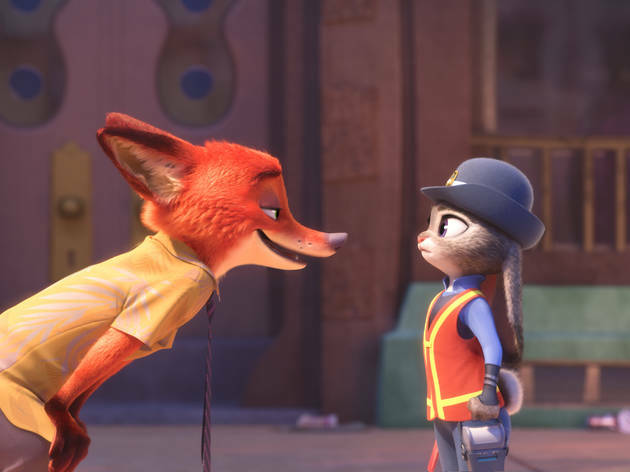 ‘Zootropolis’ is going to be huge. It’s funny, it’s charming, it’s knowing & it has gorgeously brought to life characters. Flying the flag fervently for diversity in films, it just so happens that every member of this cast happens to be furry, feisty and err, non-human and that’s one of the best things about it. This is not a film set in our world where dogs & cats are living their lives among but unbeknownst to us; the world of ‘Zootropolis’ is exclusively animal and it’s all the better for it. Following the adventures of Judy Hops, the world’s first ever bunny cop who has 48 hours to solve a crime involving missing mammals, this action packed adventure flick pairs a brilliantly witty script with charming animation and the result is a great message – that’s it’s not only ok to try and be whatever you want to be, it’s something you should be aiming to do. Don’t be held back by your size, shape & experience and let history dictate your future. Delightfully realistic in its depiction of big city living – Judy’s first evening in her shoebox flat complete with noisy neighbours, parental FaceTime and a tragic microwave dinner for one will leave your eyes suspiciously damp as you nod in empathy – the cast do a fantastic job of bringing characters to life with particular mention to the shriekingly hilarious sloths and the bat-eared fox. 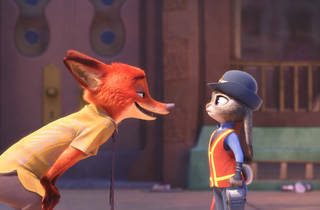 Recognisable voices like Idris Elba & JK Simmons sound like they’re having the best time, touches relating to particular species are simple but brilliant and the relationship between Ginnifer Goodwin’s Judy and Nick – a wry & twinkly voiced Jason Bateman – is lovely as it meanders the path of a suspicious judgement that turns into a true friendship. Some of the knowing digs at animated films of the past had the audience bellowing with laughter to the point of not even being able to hear the next few lines of script and the pace was quick with something new to chortle, snigger or belly-laugh at every few minutes. This is definitely a film the small people in your life will love but have no fear, it’s absolutely aimed for the big kid in all of us as well. The fantastic world of Zootropolis is smart and fun. The story is original, daring and very amusing and carries some timely, relevant and heavy messages of hatefulness and fearmongering in a way which is accessible for any age and endearing with its cry for unity and embracing your dreams. What will set this animation apart from any other is the fact that it is contemporary and it can be thoroughly enjoyed by both adults and children alike - with references made to the Godfather in such a fantastic way! There are lots of fantastic characters, the sloths are comedy gold, and the details to the characters and the city itself is incredible. Very enjoyable and brimming with charisma and charm, I would definitely recommend this film. I attended an advanced screening of Zootropolis as a Time Out Card holder in early February 2016. The film was shown at the opulent Central Picturehouse cinema adjacent to Leicester Square and was followed by a Q&A session with two of the films directors, Byron Howard and Rich Moore. I knew nothing about the premise of the film prior to the screening- only that it carried the pedigree of the Disney name. I also spotted the involvement of the directors behind Wreck it Ralph, Bolt and Tangled, all which are laudable family-friendly films that appeal equally to adults and kids. The film didn’t disappoint in this respect- there’s everything from clever intertextuality to great visual gags, provoking a steady stream of chuckles and laughter from the audience. The film has some dark moments, especially when referring to the delicate relationship between predators and prey in this imaginary anthropomorphic universe. This predator/prey theme also provides an astute conduit to address real contemporary anxieties, demonstrating how fear is intrinsic to ignorance and how difficult it is to overcome prejudices. The complex narrative is rendered more relevant by the appearance of familiar technology in the film, where animals take the subway to work and Facetime their families. But it’s not all doom and gloom- while the more composite notes will appeal to adults and older children; this is a film that is bursting with colourful imagery, driven by a fast-paced storyline and led by an extremely congenial protagonist (and even manages a very charming swindler as a foil character). The characters are energetic, relatable and well developed- this will keep everyone engaged. The visual jokes mostly rely upon characteristics of different species and animal-based aphorisms- ultimately, you can’t resist a good sloth joke and there’s always an elephant in the room. The theme of the film will resonate with all audiences and Judy Hopps, our naïf bunny hero, demonstrates an unshakeable enthusiasm makes her an attractive lead. The message that we can overcome any obstacle, even social prejudices and stereotypes that are unfairly projected upon us, and achieve our dreams- well, it’s not new, but this intelligent slant on a well-trodden moral is fresh, appealing and very enjoyable.